We are pretty excited about how well the baby’s room is coming along! 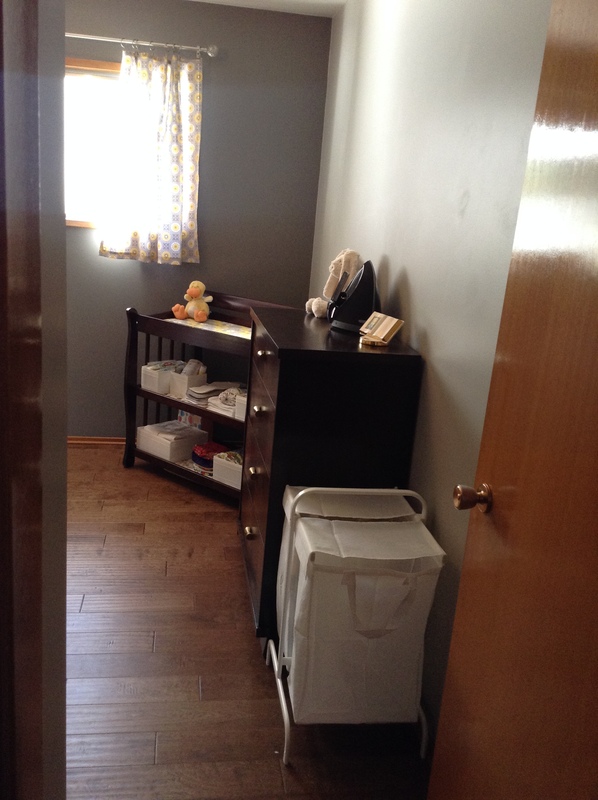 We purchased used things on Kijiji and worked on refinishing some furniture ourselves, and since I’m pretty handy with a sewing machine I made several other things for the baby’s room. We aren’t huge DIY-ers, but we do think that people can be far too wasteful and when it comes to kid stuff as it doesn’t get used for too many years before the kid grows out of it. My favorite thing that we got on Kijiji was an antique dresser that was in pretty good shape but the wood wasn’t the color we wanted – and someone painted the top white?? I spent an afternoon stripping all of the old paint and varnish off, sanded (Samuel helped), then stained it with a rich, dark walnut stain, and sealed it all with varnish. I love the color that it turned out to be, it matches the new crib and change table in the room and the grain of the wood is still visible. 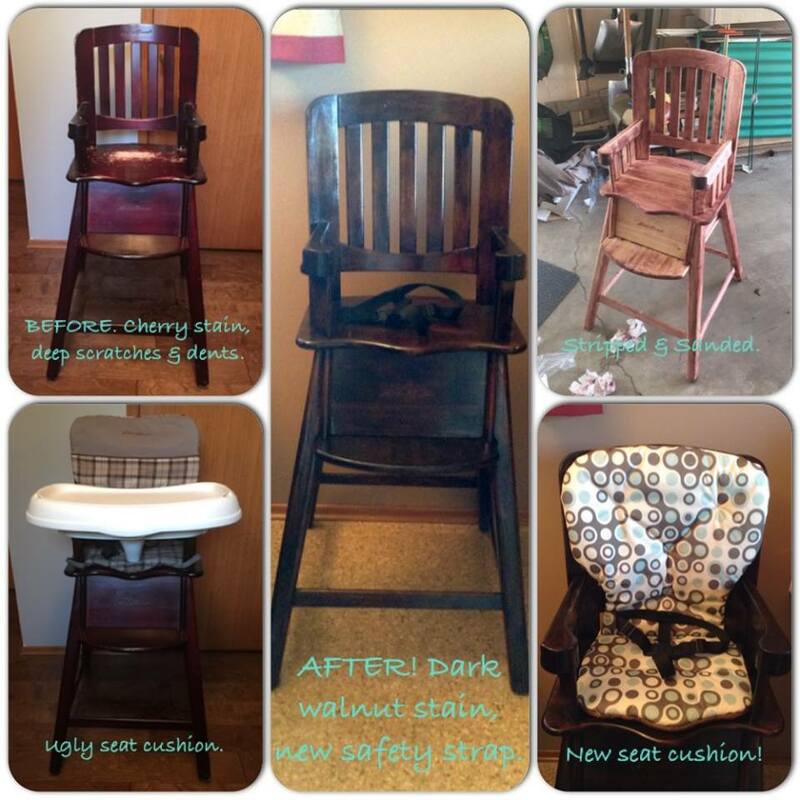 We also purchased this wooden high chair from Kijiji for a pretty reasonable price. It was originally a reddish cherry color but it had a ton of scratches and wear right down to to wood and the cushion was worn with food caked into it. Actually, most of the pieces of the chair had food caked into it so there was a lot of cleaning that had to be done. I wasn’t sure the safety strap could be salvaged but I picked up some supplies from the fabric store and re-created it using the old one as a guide. The next thing to work on was the ugly seat cushion. I used some leftover fabric from making diapers for the front and used some fabric I already had, plus some polyester batting from the fabric store. It wasn’t overly difficult to make but my machine didn’t really like sewing through the batting. I was going to make two so I would have a backup while one was being washed but I think I will just use the old one as a backup. 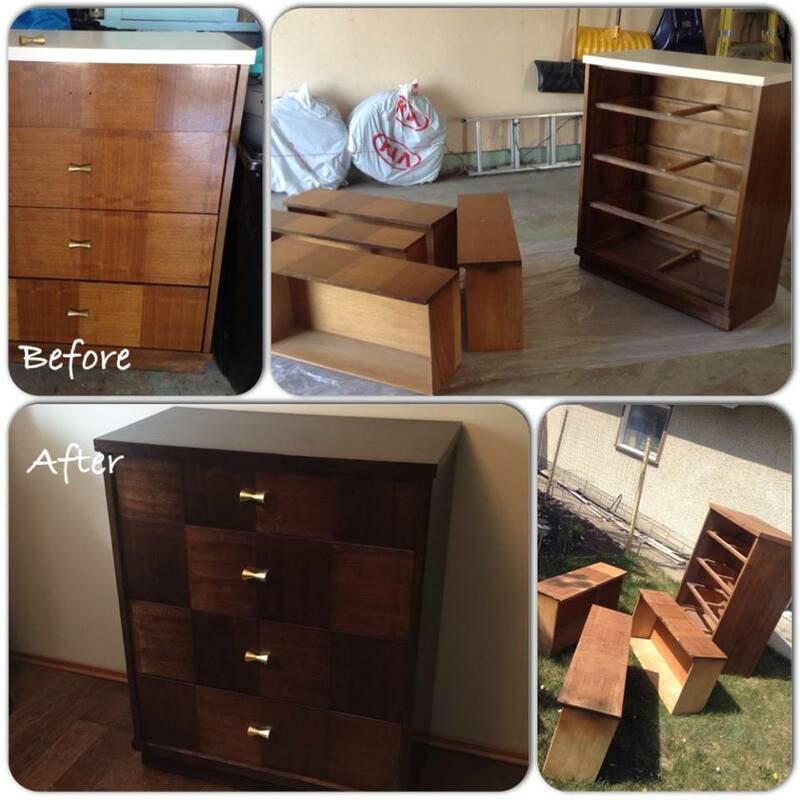 Samuel did all of the stripping, I sanded, stained, and varnished using the same color stain as the dresser. And then there’s the mural. THE MURAL! I cannot take any credit for this. 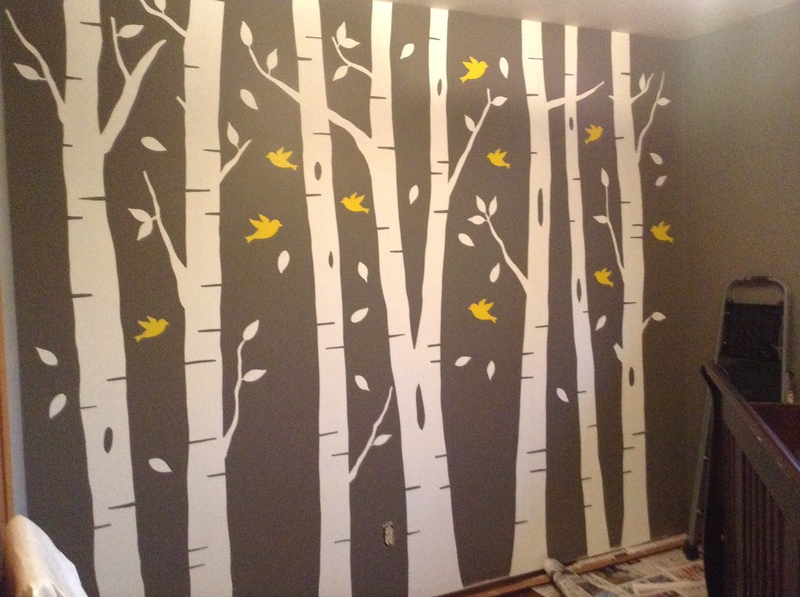 My talented mother hand painted a mural on an entire wall of the baby’s room. We collaborated on what it would look like but she did all the work. It’s so amazing! We kept the color scheme gender-neutral since we don’t know if we are having a boy or girl. The walls were already grey (we painted all the bedrooms the same color when we moved in) and decided on a bright, sunny yellow as an accent color for the baby’s room. 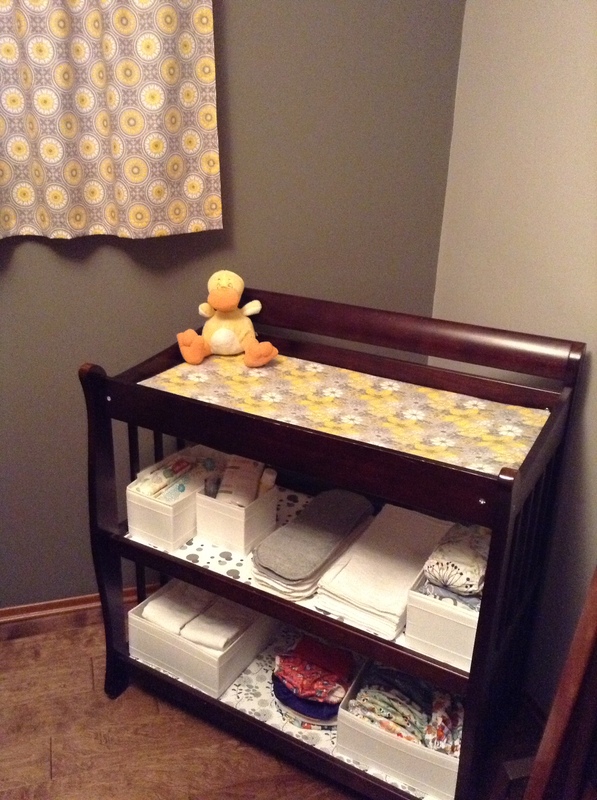 I didn’t do much with the change table but I did make a cute change pad cover (I still have to make a back-up or two for laundry day) and added some shelf paper to the shelves just to make it look a little nicer. 🙂 I love it. I also whipped up some curtains and used clip rings to hang them. Cloth diapers are still an ongoing project for me. We really wanted to use cloth diapers so I figured we would save a ton of money by making our own. We definitely are saving money but I’ve been working on them for months! I gave priority to the smaller sizes so at least they are ready to go. I was dreading organizing the closet since this room has such a tiny closet, but I guess tiny people have tiny things so it all works out for now. 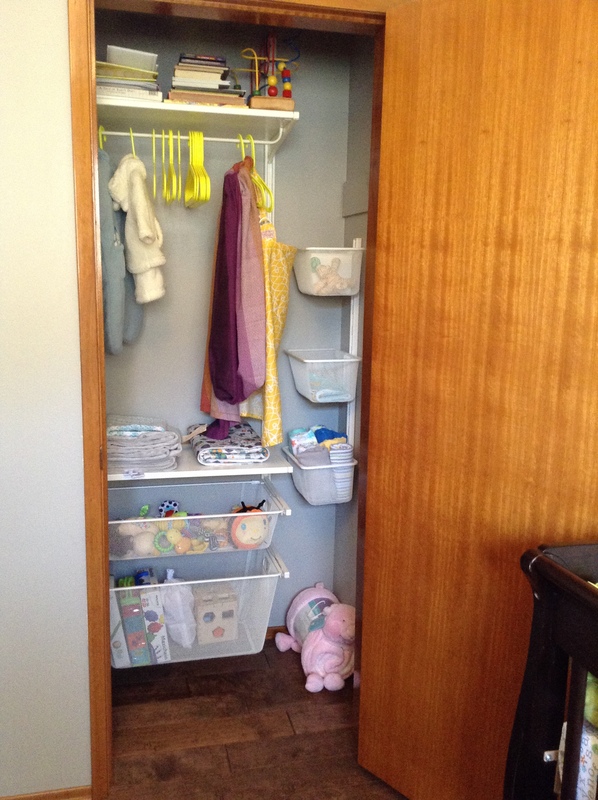 🙂 We picked up a closet organizer/storage system from Ikea and installed it into the closet, which turned out to be a lot more work than anticipated. We had to take out the old shelf and closet rod and do some spackling, priming, and painting before we could install the new system. I think it will work great for us and it can be changed as the baby grows up. 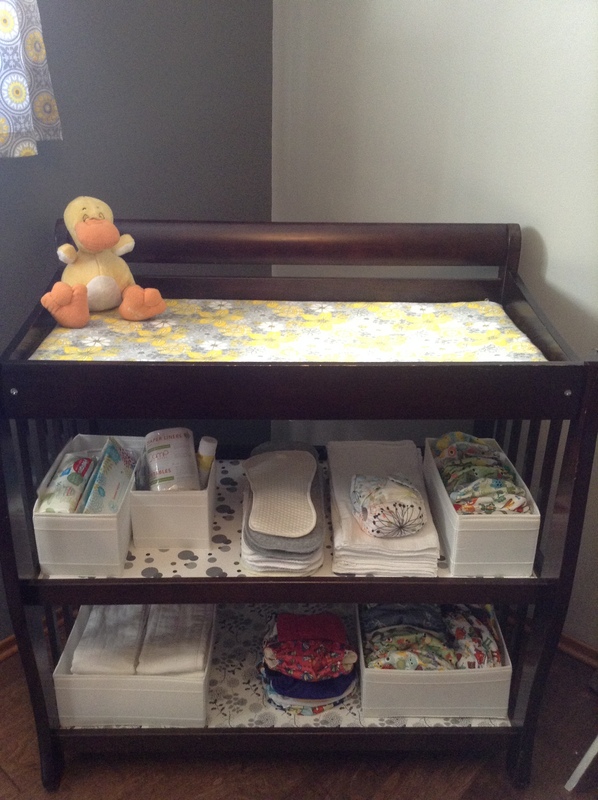 The first things we bought for the baby’s room were a crib and change table. Even though they came from two different Kijiji sellers we were able to get a matching set in decent condition! 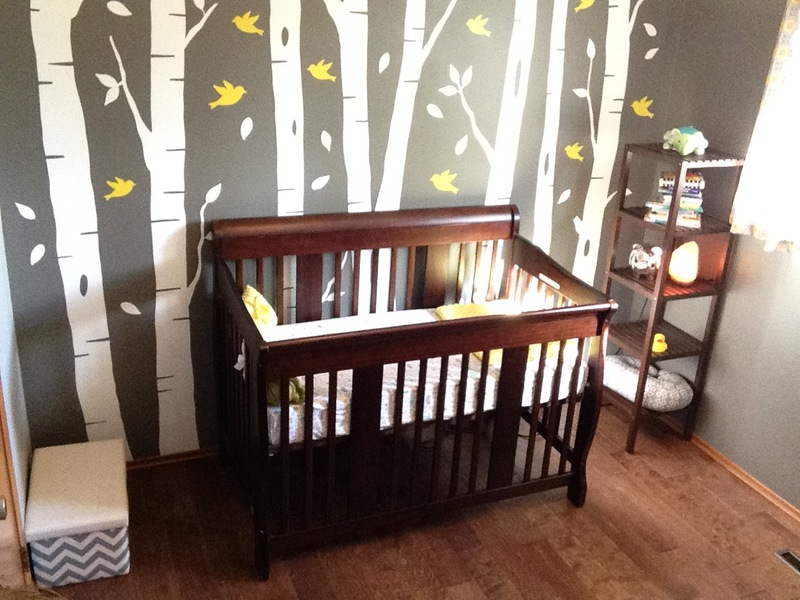 Overall I think we did pretty well getting the baby’s room ready for his/her imminent arrival. I can’t wait until there is an actual baby in there. Soon!